To learn more about Long Distance Services or view pricing information, see the UW-IT Service Catalog. The Long Distance Services (LDServices) application allows you to manage international long distance accounts for your department. 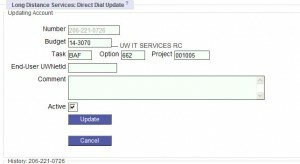 Create new Direct Dial and International UWATS accounts. Deactivate accounts that are no longer needed. Change budget information including Project Cost Accounting (PCA) for existing accounts. Associate meta-data (such as end-user UW NetID and comments) with an account. Export account information to a spreadsheet. The LDServices application is divided into three main sections: Home Page, Direct Dial, and UWATS. To begin using Rome applications (Long Distance Services, Long Distance Billing, and Technology Services and Equipment Billing) you need a UW NetID. See About UW NetIDs. The Rome role of ‘Long Distance Services Account Manager’ gives you ‘view and update’ into the LDServices pages for the given budgets or organization codes. The Rome role of ‘Bill Reviewer’ gives you ‘inquiry’ into both the TSEBill and the LDBill for the given budgets or organization codes. Contact the ASTRA authorizer for your unit to request authorization to use Rome. If you do not know who to contact, use ASTRA’s “Who Can Authorize Me?” look-up service and search by budget number or org code; then select “Rome” from the application drop-down. You will receive an automated email message letting you know your authorization to use Rome has been processed. Occasionally a security certificate error will show up on the screen at this point. If you receive an error message saying: “There is a problem with this website’s security certificate”, go to Install the UW Services CA Certificate and follow the instructions for installing the UW Services Certificate Authority. Try accessing the site again. You must setup the ‘Astra Role of ‘USER’ for this person to have access to the Rome Web pages. You have the option of also granting the role of Authorizer, but that only controls the actions that people can do in Astra, not what they can do in the Rome applications. The Home page provides some general information about the application as well as Billing Schedule information and an Account Summary. Click on the number in the “Budget Problems” column. This will filter the UWATS or DirectDial page to display only budget problems. The Preferences page allows you to turn on and off notifications, and to enter an alternate email if you would like your notifications delivered to an email other than your UW NetID@uw.edu. When you have notifications turned on, you are indicating would like to receive a weekly report containing the summary of accounts on your Budget or Org Code. The summary also shows which budgets are either no longer active, are about to expire, or have already expired. In the context of the LDServices application, a budget problem refers to budgets that are either no longer active, are about to expire, or have already expired. To avoid billing problems, please resolve these issues as soon as possible. If you would like to receive a weekly report containing this account summary you can activate it on the Preferences page. Budget no longer Active The budget status is not equal to “1”. It is not open for posting and cannot be used for billing a long distance call. Change your accounts to a different budget that is within your Astra authority. Budget is about to Expire This is a warning that the budget has a ‘current period end date’ which is less than 60 days from now. Please get the budget’s end date updated in the FIN system (the central Financial system) or change your accounts to a different budget. Budget has Expired The budget has a ‘current period end date’ that is in the past. We might not be able to use this budget to bill your long distance calls. Change your accounts to a different budget or get the budget’s end date updated in the FIN system. Budget is not in the file index The budget number is not present in the central Financial system’s Budget Index table and cannot be used in this application. A Direct Dial account represents a telephone that has been configured to allow long distance calling by simply picking up the phone and dialing 1 plus the number you would like to call. This service is also sometimes referred to as “toll calling” or “unrestricted calling.” For more information about the Direct Dial service see Long Distance Options. This table contains a filtered list of accounts you are authorized to manage. Above the table find feedback about how filtering has affected the list of accounts being displayed. Use the Filter Accounts toolbar to adjust the accounts that are displayed. Look up the number using the Add or Update an Account form. Click on the telephone number in the Direct Dial Accounts table at the bottom of the Direct Dial page. Note: The history table is located at the bottom of the Direct Dial account update page. The Filter Accounts toolbar lets you control which accounts are available in the Direct Dial accounts table. You can filter by budget number, PCA codes, budget status, or account status. After entering filter criteria, press the [Apply Filter] to update the accounts table. To reset filtering to the default, press the [Clear Filter] button. You will have the option to open or save the Microsoft Excel file. Use the form located at the top of the Direct Dial page to either add a new Direct Dial account or update an existing account. Enter the account number and click [Go] to go to the Direct Dial Update page to update account information. Note: UW NetID and Comment are not required fields; however, without one or both of these fields, research of the account becomes difficult. Please provide a UW NetID if known, and a descriptive helpful comment if not. Accounts without a UW NetID or comment, should be researched to find their owner. Account [nnn-nnn-nnnn] is not currently configured for the direct dial long distance service. Use the form below to activate it. The Direct Dial account update page will be displayed. 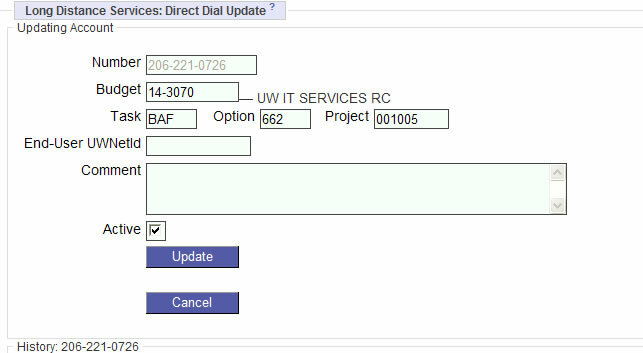 Select the accounts to change (click the check boxes along the left side of the Direct Dial accounts table). In the section titled “Change Budget Information for Selected Accounts”, enter the new budget number, status, task, option, or project number, or clear existing task, option, or project numbers. Click [Change] to change budget information, or Click [Deactivate] or [Activate] to activate or deactivate the selected accounts. Click to activate the account. Click to deactivate the account. Click [Deactivate] or [Activate] to activate or deactivate the selected accounts. Change filtering using the Filter Accounts toolbar to make an appropriate set of accounts available for manipulation. When will account changes take effect? When a Direct Dial account is deactivated, the telephone configuration will be updated so that it no longer has the Direct Dial service. The LDServices account for the number will remain available in a deactivated state until all outstanding calls have been billed (60 days). This leaves budget information available when the long distance bill is processed. After this period the account will be removed from LDServices. A UWATS account represents a unique 7-digit code assigned to individuals for the purpose of billing international calls to their budget regardless of which telephone they use to place the call. Click on the UWATS Code on the Accounts table at the bottom of the UWATS page. Click [Add] in the Add a New Account field. Click [Cancel] if you do not want to create the account. Use the form located at the top of the UWATS/UWDirect page to Update an Existing Account. Enter the UWATS Code and click [Go] to go to the UWATS Update page to update account information. Note: UW NetID and Comment are not required fields; however, without one or both of these fields, research of the account becomes difficult. Please provide a UW NetID if known, and a descriptive helpful comment if not. Accounts without a UW NetID or comment should be researched to find their owner. The Filter Accounts toolbar lets you control which accounts are available in the Accounts table. You can filter by budget number, PCA codes, budget status, or account status. After entering filter criteria, click [Apply Filter] to update the accounts table. To reset filtering to the default, click [Clear Filter]. Use the Filter options to create the account data set to export. Click on the Export icon (located just above the Accounts table). 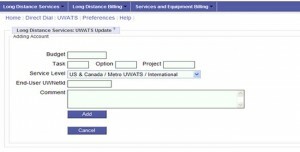 Select the accounts to change (click the check boxes along the left side of the UWATS/UWDirect Accounts table). 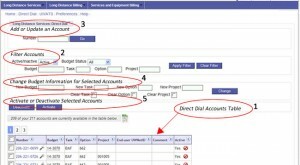 In the section titled “Change Budget Information for Selected Accounts”, enter the new budget number, status, task, option, or project number or clear existing task, option, or project numbers. Click [Change] to change budget information or click [Deactivate] or [Activate] to deactivate or activate the selected accounts. 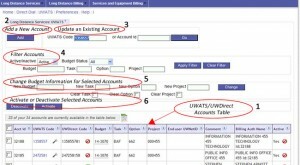 Select the accounts to change (click the check boxes along the left UWATS accounts table). When a UWATS account is deactivated, it will immediately be made unavailable for UWATS calls. The LDServices account will remain available in a deactivated state until all outstanding calls have been billed (60 days). This is necessary so that budget information is available when the long distance bill is processed around the middle of the following month. After this period the account will be removed from the LDServices. Deactivating a UWATS account will also cause UWDirect service for the account to be deactivated, assuming UWDirect was active on the account. When UWDirect service for a UWATS account is deactivated, it will immediately be made unavailable for UWDirect calls. This will not affect regular UWATS service for the account. Billing Auth Name is not directly editable. It is calculated by taking the “Account Id” field of the UWATS account and prefixing it with either the “End-user UW NetID ” field (if it is not empty) or the first 20 characters of the “Comment” field. Previous, internal versions of this application used first and last name fields to identify end-users and that information has been saved in the “Comment” field of each account to ease the transition to using UW NetID . “Account Id” is not the same as the “UWATS Code”. (The UWATS Code is confidential information and for that reason cannot appear on the long distance bill). 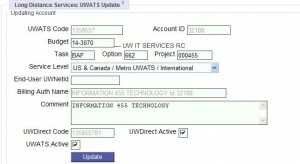 It is, however, a unique identifier for a particular UWATS code and should be used if you need to correspond with UW-IT Customer Care or UW-IT Business and Finance.